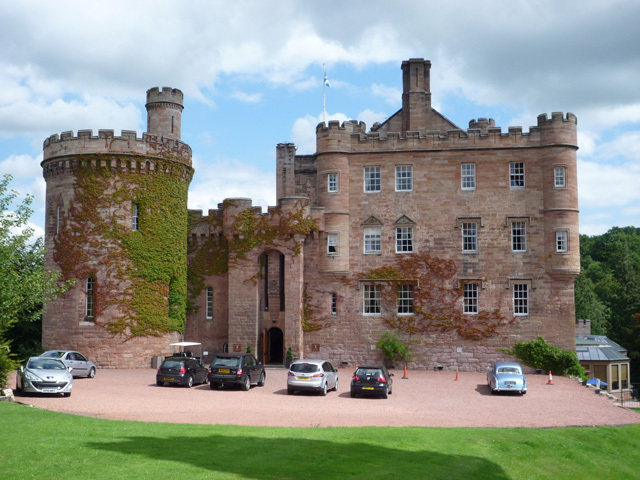 Notes: Dalhousie Castle is a castle in Midlothian, Scotland. Dalhousie Castle is situated near the town of Bonnyrigg, 8 miles (13 km) south of Edinburgh. The castle was the seat of the Earls of Dalhousie, the chieftains of Clan Ramsay. On 26 June 2004, a major fire erupted in the castle's roof area. The building was evacuated and the Lothian and Borders Fire Brigade was called to extinguish the blaze. The damage was significant but limited to a relatively small area of the building and no major structural damage occurred. The damage was repaired and the hotel resumed normal operations. In April 2011 Von Essen Hotels fell into administration and the hotel was available with a guide price of 7.5 million. In March 2012 it was announced that Robert Parker, owner of Doxford, Eshott and Guyzance Hall in Northumberland had purchased Dalhousie Castle for an undisclosed sum.